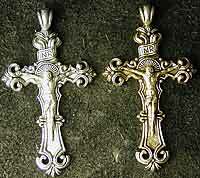 Antique silver finish over pewter or antique gold over brass finish. American made and lead free. A nice ” weighty ” feel in your hand. Terrific detailing.